Frank Brennan. Interview By Ged Moran. Close Quarter Karate - The neglected range. By Steve Hyland. Master Hirokazu Kanazawa. Interview By Jim Palmer. Correct Stretching. By Aidan Trimble. Japanese & Western Instructors (Part One). By Lisa Schambach. Funakoshi's Disciples: Kimio Ito & Osamu Ozawa. Sensei Masao Kawasoe Course. Report By John Cheetham. Well, here we are again, another three months on and SHOTOKAN style Karate is certainly not on the 'decline' as many 'non-traditional' people thought would eventually happen. I think I'm in a good position to say that our style is definitely just as popular as ever for the very simple reason that is 'SOLID', with a structured basic foundation and a great traditional history. I also feel that for someone starting a Martial Art, Shotokan for beginners is perfect, with our standard 'Basic' techniques which are the same the world over. There is nothing worse for a beginner than to have to change things from week to week, or month to month because the Instructor has had a 'brain-wave'. CONGRATULATIONS from all S.K.M. readers to Master Shiro Asano 7th Dan on his 20th anniversary of teaching in the U.K. In attendance at his party were Sensei's Kato and Kanazawa. Without doubt one of the best kickers in British Shotokan Karate is Aidan Trimble 4th Dan. Aidan explains how to stretch correctly and what to avoid. 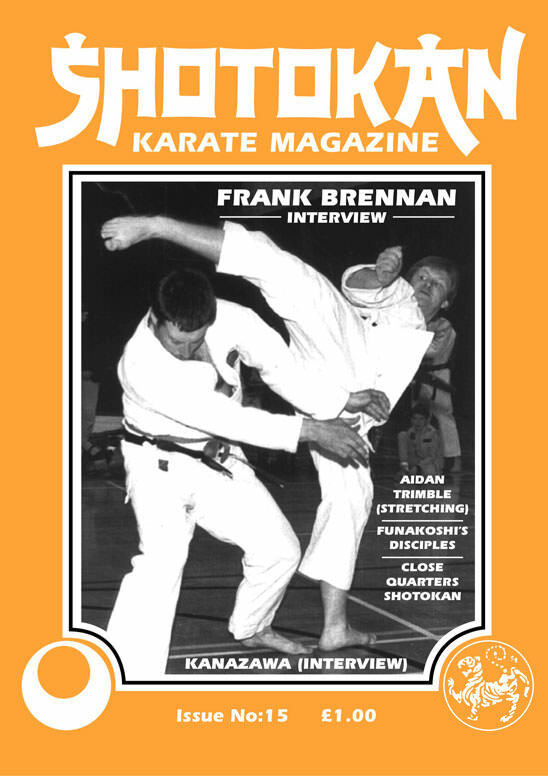 We have a great interview with Frank Brennan, kindly donated by a former KU.G.B. instructor of twenty years standing, Mr Ged Moran who is now part of the Shotokan section of the B.K.A. (British Karate Association) who have many senior Shotokan people in the group. The interview was given by Frank at Ged's house and has a nice relaxed feel about it and is also featured with the Video, 'The Brennan Profile' which by the way is excellent and well worth investing in for any Shotokan video collectors. (advertised in this issue of Shotokan Karate Magazine, see Legend Videos). Also in this issue we have an exclusive, although short interview with the S.K.I. World Chief Instructor, Master Hirokazu Kanazawa 9th Dan Kanazawa explains why he founded S.K.I. and why he left the J.K.A.